Album of the year! 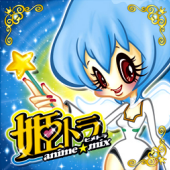 Okay, it may be a tad early to make such a bold claim, but Hime Trance Anime*Mix! is at least the best trance release to come out of Japan in quite a while. Unlike the last 3 or so Hime Trance releases, Anime*Mix! has a very good ratio of new songs to old. And while there are a few repeats, almost all of them are exceptional and are worthy of being repeated. If you’ve soured on trance because of the constant repeats, then Anime*Mix may well reinvigorate your love of trance. Anime*Mix! brings together some of the best trance producers Japan has to offer. Delaction and Dank-One once again bring their A-games, while newer artists such as Redalice and CMS help to add a dose of freshness. Unfortunately, the booklet is light on credits, so it’s hard to tell who produced some of the tracks. Interestingly, while the first half of the album is a standard 145 BPM, the second half speeds up significantly. At first it goes to 150, but soon reaches around 165 before ending at 180 BPM. Methinks that if there’s a Hime Trance Speed 2, a good chunk of the second half will be repeated. Sales have been decent so far, though from what I can tell it’s tracking slightly below Hime Trance Speed. I certainly hope sales improve so that we can guarantee a sequel. EMI are pretty much out of anime songs to repeat, so a potential sequel would be 100% new material. Order at CDJapan. First-press copies come with stickers, but all copies will come with a lyrics booklet. Full track-by-track review after the jump.